Glass Artist and Designer, Roger Nachman has worked in glass since 1977. A graduate of the University of Colorado, he lived and worked in Kyoto, Japan for eight years between 1973 and 1985, and exhibited in numerous group shows and one-man exhibitions in Japan and the United States. 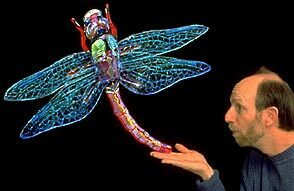 In 1983, Mr. Nachman co-founded the Miasa Glass Program, a creative Glass Arts Workshop in the Japan Alps, which became a vital part of the Studio Glass Movement in Japan. Roger returned to the U.S. in 1985 and established his studio in Seattle, Washington where he produces a wide variety of fused, kiln-formed, and kiln-cast sculptures and installations. Roger Nachman Glassworks, specializing in “Art for Architecture,” accepts architectural commissions for the home and public environments. In addition to his studio work, Roger teaches kilnworking techniques for glass and is often invited to teach workshops around the country and abroad.